This beautiful dwarf Japanese garden juniper has a slightly mounding habit, long wide-spreading stiff branches that hug the ground. The tiny needle like foliage is a blue-green color in summer changing to green-purplish in winter. Drought, heat, and cold tolerant once established. Adapts to a wide range of soil conditions. Excellent ground cover in beds that have full sun exposure, hillside planting makes this a good choice for erosion control. We offer procumbans Nana 15" to 18" in a 3 gallon container. Great ground cover for hill sides and rock gardens. The Juniper is one of the toughest and most versatile evergreen landscape plants. It ranges from spreading ground cover types to large conical or pyramidal trees. Upright varieties are excellent as a screen, hedge, single specimen or as a windbreak. 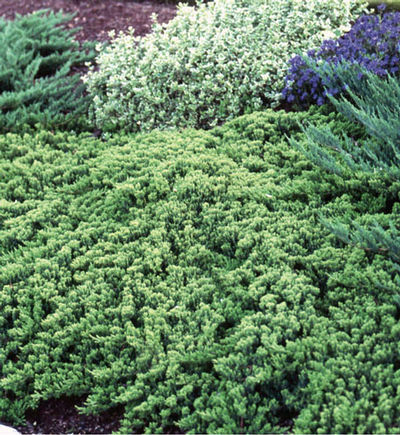 The low growing varieties are limitless when used as ground cover, foundation planting, grouping, or mass planting and to soften rock gardens. Needle-like foliage ranges in color from lustrous dark green to light green, blue, silver-blue, yellow and shades in-between. This resilient plant adapts to a variety of soil types and can withstand wind, drought, heat and humidity. Excellent for erosion control and can even withstand a little nibbling from deer and rabbits.